Quality- Tropical Flooring is synonymous with quality. A clear leader in the development of new products and advanced production schedules Tropical Flooring has shown time after time that quality can cross from one product category to another. Starting in the cork flooring field Tropical Flooring has used the same quality theory to further expand into Wood floors, Bamboo Floors, Linoleum, Rubber, and laminate flooring. Our commitment to this simple but often overlooked aspect will continue to drive our success. Highest quality raw materials are procurred. Tropical Flooring is commited to only purchasing raw materials from suppliers who practice managed forestry and have a reforestation plan in place. Our commitment can be seen through our dedication of our all natural "Eco Friendly" product lines including Cork, Bamboo, Linoleum, and Rubber flooring. Our production lines consists of machinery from Switzerland, Germany, and Japan. Each of our factories has a strict quality control protocol to follow and an inspector for each line. Only the highest quality raw materials will be selected for manufacture into Tropical Flooring products. Many of our products have been developed exclusive to us in order to supply our customer demand for unique, high quality products. Tropical Flooring products offer up to 10 coats of Aluminum Oxide enhanced finish. Eastern Australia from Queensland southward to Victoria and also in Tasmania. Introduced into East and South Africa, India, Ceylon, Chile, and Argentina. Heartwood golden to dark brown, sometimes with a reddish tinge; dark streaks mark the growth zones; sharply demarcated from the straw- colored sapwood. Lustrous; texture fine to medium; grain usually straight, sometimes interlocked or wavy; without distinctive odor or taste. Exotic Walnut has a Janka hardness rating of 1100 compared to 1260 for Red Oak. Working Properties: The timber is easy to work with hand or machine tools; can be steam bent easily down to a 3-in. radius; glues and stains well and can be highly polished. Durability: Durability of heartwood is reported as intermediate and is readily attacked by termites; sapwood is moderately susceptible to Lyctus attack. 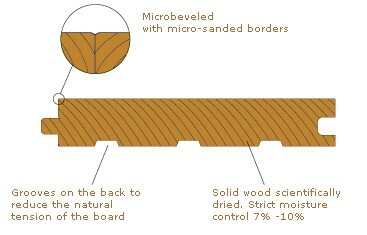 Preservation: Heartwood is reported as not treatable using either open tank or pressure systems. Moderately heavy vessel penetration is obtained in the sapwood. A. Always follow the manufacturers recommended installation procedure. 2. Or brace between truss/joists in accordance with the truss/joist manufacturer’s recommendations and with local building codes. Some truss/joist systems cannot be cross-braced and still maintain stability. 1. An asphalt laminated paper meeting UU-B-790a, Grade B, Type I, Style 1a. 2. Asphalt-saturated kraft paper or #15 or #30 felt that meets ASTM Standard D-4869 or UU-B-790, Grade D.
1. Choose a starting wall according to the most aesthetically or architecturally important elements in the room, taking into consideration fireplaces, doors, cabinets and transitions, as well as the squareness of the room. The starting wall will often be the longest unbroken wall in the room. 2. 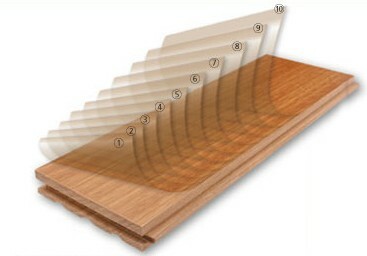 Snap a working line parallel to the starting wall, allowing ¾” expansion space between the starting wall and the edge of the first strip or plank run. 3. As a general rule, a ¾” expansion space must be left around the perimeter and at all vertical obstructions. 4. Random-width plank is laid out with alternating courses varying by widths. Start with the widest board, then the next width, etc., and repeat the pattern. 5. 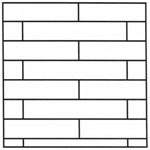 Lay one row of strip or plank along the entire length of the working line. 6. Top-nail and blind-nail the first row (hand-nail if necessary), using appropriate fasteners. Denser species may require pre-drilling. Each succeeding row should be blind-nailed with the nailing machine wherever possible. At the finishing wall and other obstructions, it may be necessary to blind-nail by hand until top nailing is required. 8. To minimize expansion on floors wider than 20 feet, more or less spacing between rows may be needed, depending on geographical area, interior climate control and time of the year. spacers that may cause damage on factory-finished products. or every 10”-12” on face-nailing. 12. Follow manufacturer’s instructions for installing plank flooring. increase holding power, there are three options. b. Apply an approved wood flooring adhesive. for wider boards. Typically, the relief cut should be 3/8” on a ¾” board. NOTE: These options, however, will not necessarily eliminate cupping. 14. Blind-nail and face-nail, as necessary, to complete the final rows. the center point, see Appendix G, Trammel Point Method. the center of that room. 4. Drill and hand-nail the first three rows through the tongue. DO NOT USE TOP NAILS. described earlier in the chapter. 7. Install a spline or a slip tongue in the groove of the board that was against the straightedge. Put wood glue down the entire length of the groove before installing the spline.